Arunachal Pradesh Education Minister Honchun Ngandam called on State Governor BD Mishra at the Raj Bhavan, Itanagar on Tuesday. They had a discussion on improvement in the the education sector. The Governor advised the Education Minister to focus on infrastructure requirement of the educational institutions starting from primary schools. He also asked the Minister to streamline the distribution of mid-day meals among the school students. 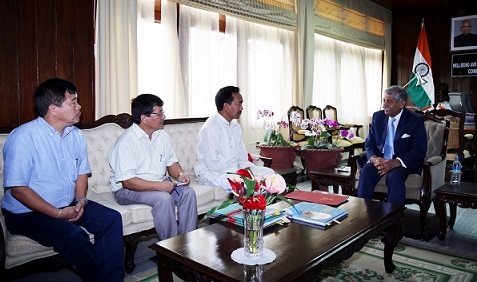 Sharing his interaction with the Union Human Resource Development Minister, the Governor also expressed his concern regarding the non-appointment of heads of premier institutes of the State, i.e. Rajiv Gandhi University and the National Institute of Technology. The Governor informed that to strengthen the education sector of the State, he has constituted a ‘Study Committee’ which will be submitting their findings very soon. The Governor also said he wants that the children of the State be taught and developed in such a way that they compete and excel with all-round performance in comparison with the children of hinterland.